This dish with a holiday aroma is quite tasty and can make a great healthy dinner for the family. Bring 2 ½ cups water to a boil in saucepan over medium-high heat. Add ½ teaspoon cinnamon, the ginger, 1 teaspoon salt and ½ teaspoon pepper. Add the carrots and cook until crisp-tender, 3 to 4 minutes. Drain the carrots, reserving the cooking liquid. 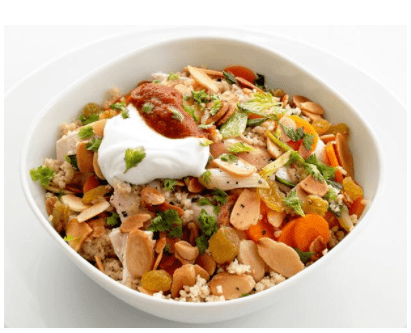 Put the couscous and chicken in a medium bowl, pouring 1 cup of the hot cooking liquid on top. Stir, then cover tightly and let sit 5 minutes. Meanwhile, melt butter in a medium skillet over medium-high heat. Add the almonds, raisins, scallions and the remaining ¼ teaspoon cinnamon. Cook, stirring, until the nuts are toasted, about 2 to 3 minutes. Stir in the cilantro. Fluff couscous with a fork. 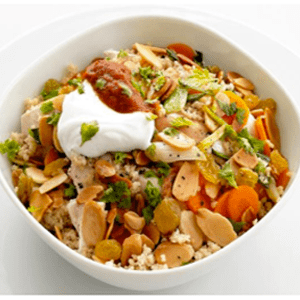 Divide the couscous and chicken among bowls. Top with the carrots and more of the cooking liquid, if desired. Sprinkle with the almond mixture and more cilantro. Top with yogurt and harissa.